Repair cuts, scratches, pet damage, tears, holes, creased or cracked leather, works on vinyl too. *Must be top coated with Color Flex. See Hints & Tips for tech tip regarding seams. 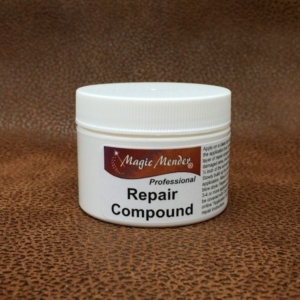 Magic Mender repair compound is a water based, urethane filler used for cuts, scratches, pet damage, tears, holes, creased or cracked leather, works on vinyl too . It spreads like soft margarine. It dries naturally, or drying time can be accelerated by using a blow dryer. When dry, it permanently adheres to leather and vinyl. Our repair compound is extremely durable and remains soft and flexible, giving your repair the natural feel and appearance of the original surface. Start by cleaning the surface with a damp wash cloth using a mixture of a little liquid dish soap and warm water. Then wipe clean with a damp wash cloth and allow surface to completely dry. Prepare the surface next by cleaning with Presto Prep Cleaner. Allow to completely dry before starting your repair. Spread on thin layers, not just one thick one. It won’t dry properly if you try to apply too much at one time. Three to four layers (or more) is typical. It’s better to apply just a bit more than less. You can always smooth it our with Presto Prep. This way your repair will blend into the surrounding area. If you can still the damage, apply more repair compound. Use a blow dryer, low heat, to accelerate drying time. To remove any bumpy spots and to smooth out your repair, wet a paper towel with Presto Prep and wipe across the surface just as if you were sanding. Be careful though because Presto Prep slowly softens the repair compound and will eventually remove it if you over do it. Normally our repair compound is applied under Color Flex colorant but can also be applied over it if you find that you need to touch up the area. In that situation Color Flex must be applied again to seal the repair. Cleans up with soap and water or Presto Prep.